This blog is primarily about my journey to learn art-making in adulthood and I've talked a bit about using focused practice to build skills. But what do you do when focus seems impossible and practice sounds tedious and boring? What happens when you burn out? 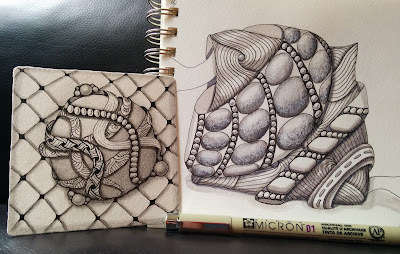 I was just chatting online with a fellow artsy friend who was feeling down and uninspired. She was still drawing and keeping up with group art challenges, but it felt like a slog. She didn't like the way her work was turning out, though the rest of the group saw wonderful passages in every piece and a new fluency overall in her technique. I could absolutely relate. I've been there. SO many times. 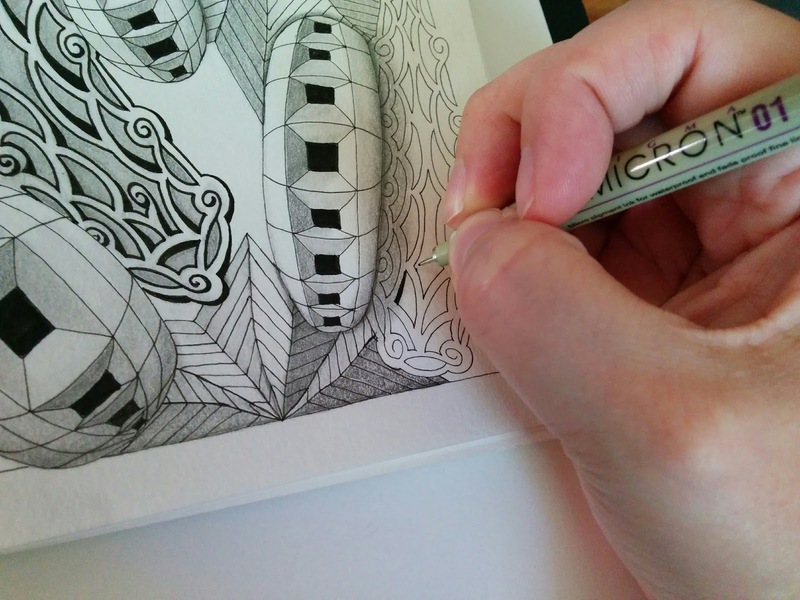 As zen as Zentangle can be, the intense, up-close focus on tiny, tight, little details can get mentally wearing. 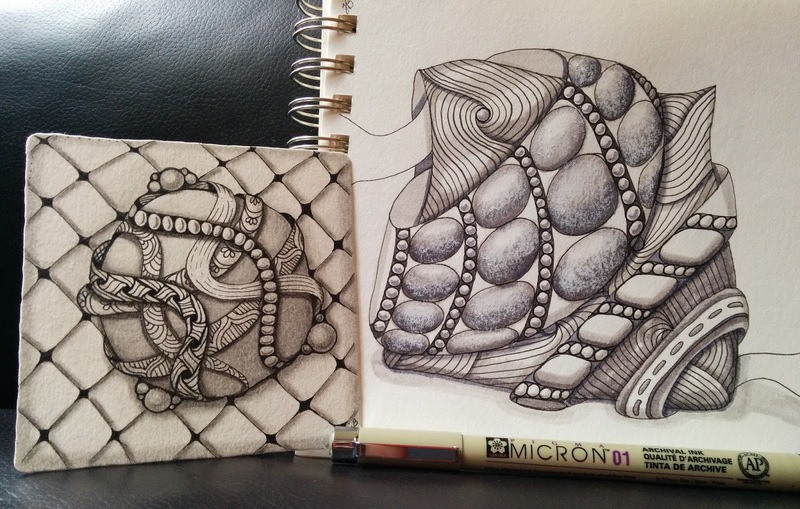 Two small drawings less than 5 inches square, with fineliner Micron pen for size. Even the way we hold our pencil when we write -- close to the tip, upright, almost entirely controlled by fingers and wrist. And it's more of the same when we use technical drawing pens like the Pigma Microns for Zentangle. Upright hand position, close to nib, used for drawing with technical pens. Our bodies need moments and movements of expansion to counteract all that time spent in contraction. Our bodies and our brains need us to look up, gaze at far off objects, open arms wide, and take deep, full breaths that re-light the fire in the belly. Our art needs the moments of expressiveness that come from larger arm movements using elbow and shoulder. It needs us to step back from the paper or canvas for a wider perspective on ourselves and our world. And it doesn't hurt that our art benefits from the cross-body movements that activate more of our brains. In fact, according to artist and educator Dan Nelson, the part of your brain that controls your arm is a better artist than the part that controls your fingers. and loosen up for a while. 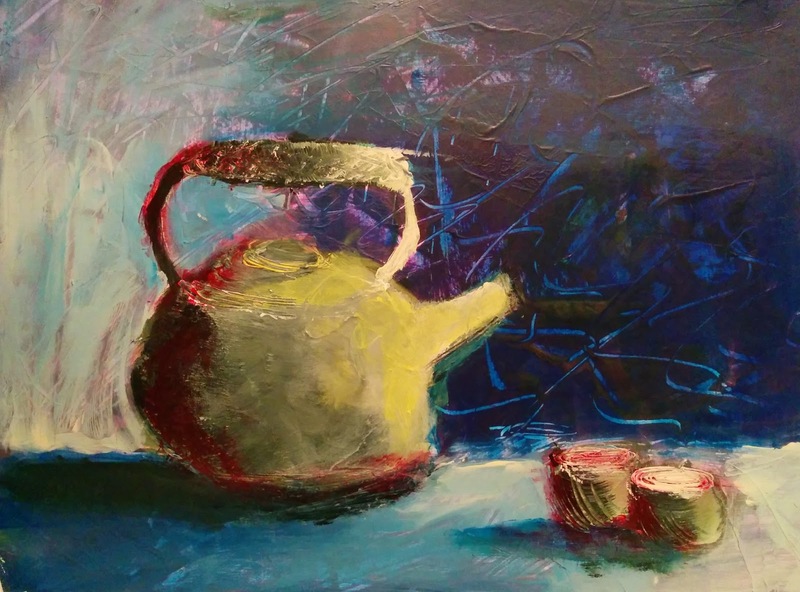 One of my favorite contemporary painters, Robert Burridge, talks a lot about loosening up in painting and letting the art viewer see just how much fun it is to be an artist. In fact, he has entire books and DVDs on loosening up as a painter. So if you're feeling burned out, shift your body to shift your outlook. Stand up, throw your arms out wide, lift your eyes, and breathe deeply. Try something different and make it about play, about experimentation, about adventure, and looking outward, and discovery. Make art with your whole body. 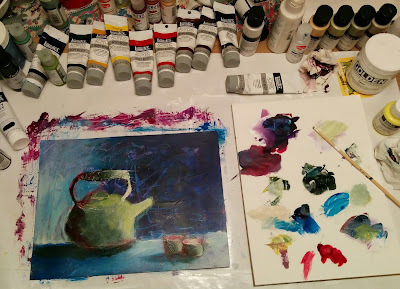 Painting work table with an array of paints and a work in progress.